After having trouble for quite some time, often being offline due to attacks and various other issues and even announcing that it will be shut down permamently it seems that the mining pool Yaamp has found a solution. If you try to open the official website of the pool you will notice a message saying that it has been purchased by NiceHash and the mining has been redirected to the stratum servers of the new owner. 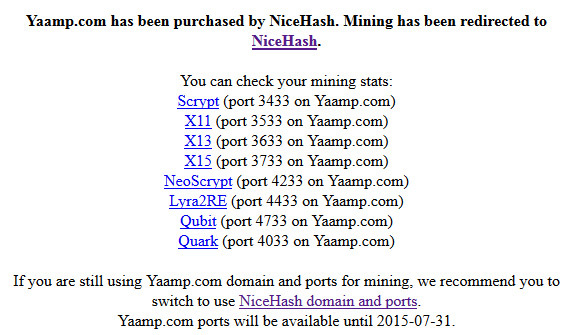 There is also a recommendation to switch to the NiceHash mining pools as after 2015-07-31 Yaamp will stop their stratum servers that are currently just redirecting to NiceHash. So if you are still mining at Yaamp you might want to consider moving either directly to NiceHash/WestHash or another mining pool.